The Raspberry Pi computer board. Most computers today are built for a single purpose, which limits the need for people to ever get to know how they actually work or how to programme them. Devices like the Raspberry Pi intend to change this, and help provide the next generation of computer coders and programmers with the fundamentals they need to make a career in what is becoming one of the most important job sectors. In an interview with Eben Upton via Skype from the UK, the founder of the Raspberry Pi Foundation told ITWeb the credit-card-sized computer board was created almost by accident and the team never expected it to take off like it has. The idea for creating an affordable computer, which would be both functional and simple enough for a child to learn coding, came from the computer science department at Cambridge University (where Upton worked), which noticed a steady decline in the number of applicants in the mid-2000s. Upton said one of the reasons identified was that all computers these days were pre-programmed single-use devices. Young people did not have to play around with these devices, and write scripts to make them do what they wanted, as these days they "just work". In the 1980s, this wasn't the case, said Upton. "Tinkering with machines lured you into programming in a natural way." He noted that for a lot of users, the move away from programmable machines to fixed-function equipment has been a good thing, but this means school children are "not accidentally becoming programmers anymore". The foundation was therefore created to boost an interest in computer programming and STEM learning in young learners. 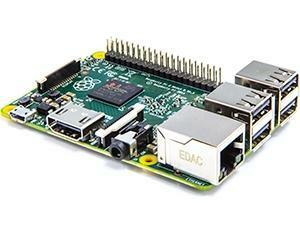 At this stage, the team had not yet come up with the Raspberry Pi that would eventually go to market. However, the foundation knew it would be called the Raspberry Pi ? combining the trend at the time to name tech companies after fruit, and the programming language they were planning to use on the device: Python. Raspberry Pi founder Eben Upton via Skype. The team was playing around with prototypes in May 2011 when the BBC did an interview with one of the co-founders and uploaded a short 2.30-minute video to YouTube. In the video, Raspberry Pi Foundation co-founder David Braben explains the Raspberry Pi is a small USB-sized computer which allows for a keyboard and screen to be plugged in and be used to learn programming or run social media accounts like Twitter or Facebook. "But also [for school children] to be able to understand the whole process of programming; a lot of things have been 'confusticated' these days, in the sense you can't get at them. There is so much between you and doing something interesting or creative that it gets in the way. And hopefully this device will be one of the pieces that helps change that," said Braben. "The idea is that [the device] will cost £10 to £15 (R180 to R270) so that they could effectively be given away to school children. It will let them engage with a lot of things that we are all consumers of but not actually creators of." The video was viewed 600 000 times overnight. Upton said the foundation did not realise there would be such strong interest and got to work creating the product, eventually launching it in February 2012. The team initially envisioned selling 1 000 Raspberry Pi boards, but demand peaked rapidly to 10 000 boards and, five years later, 15 million units have been sold around the world. Upton says although the 1980s was a time when some could tinker with programmable computers, they were also problematic from an inclusivity perspective. He says as a result, most people in the field now look like him: a thirty-something white male. Upton says one of the foundation's goals is to engage with larger groups, as diverse as possible. He says the foundation is now reaching 100 000 school children per week across the globe through various partnerships and campaigns. "If all we do is give middle-class boys in the UK another advantage, then what have we done? This is no use," says Upton. The entity is working on getting Raspberry Pi boards into schools in rural areas across the globe, and says this is where the most interesting innovation is often seen. Upton gave the example of a person in Japan, who linked up the computer board to a robot to help his parents, who were cucumber farmers, sort their produce into different categories. This made the whole process more efficient and saved his parents a lot of time. The 'Pi Cluster', created by Gareth Stephenson. This type of solution would have cost a lot of money to implement if it was bought off the shelf. However, the cheap computer boards allow children to work on ways of solving unique problems in their environments. 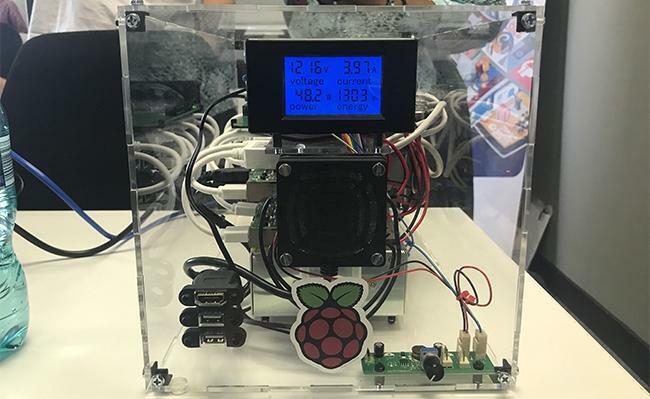 The ITWeb interview with Upton took place at a Raspberry Pi Jam event, the first of its kind to be held in South Africa. These events happen around the world, and are a place for like-minded Raspberry Pi enthusiasts of all ages to come together to build new projects or share what they have been working on. There have been over 1 000 jams since 2012. The South African event was held at Entelect Software's headquarters in Melrose Arch, in partnership with official Raspberry Pi distributor RS Components. It took the format of a 'show-and-tell' presentation where enthusiasts shared what they had been working on. Prizes were awarded for the most innovative solutions. There were over 40 people in attendance, with nine Pi projects presented. Willie Strydom was awarded the prize for the most innovative build. He created a single user interface, which can be accessed via an iPhone or Apple Watch app, to control various home automation applications. The judges say this project was selected as the winning entry based on its relevance, usefulness and future potential. Second place went to Gareth Stephenson, who presented his 'Pi Cluster' project, which tested the concept of cluster computing using Raspberry Pi. Third place went to Schalk van Heerden for his 'Cherry Pi Brewery' project, which is a prototype concept for a fully automated micro-brewery. Other notable projects were a self-driving car, developed by Philip Booysen, and an offline library developed for underprivileged students, designed by Yoshiaki Nagasawa. "Since the day the Raspberry Pi was launched in South Africa in 2012, it was an instant hit with design engineers, makers and anyone who loves tech gadgets because of its cost and the fact that it functions as a mini computer," says Brian Andrew, RS Components GM for SA. "Although it was initially designed to promote STEM learning and coding, it has successfully been used in both business and home applications."